The Video Management Software (VMS) chart below will help you select the right software for your application. VMS runs on a Windows computer and allows you to view multiple cameras, record and retrieve video and monitor alarms. 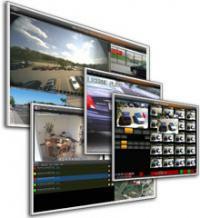 We provide a choice of Video Management Software (VMS) that works with many types of IP cameras. Take a look at the VMS comparison table below which provides a review of IP camera recording software from OnSSi, TruViewIP, Hanwha, Milestone, and Axis. Similar software is available in Network Video Recording (NVR) systems. The NVR is a complete recording system that includes both the computer and camera recording software all in one box. These NVR products are Windows (or Linux) based systems that are easier to install and use but are usually not as flexible or sophisticated as the VMS software loaded on your computer. Each IP camera recording software platform has some unique capability that fit specific applications. For example, some provide motion detection and helpful tools for finding recorded video segments. Others are compatible with smart mobile devices and some are easier to integrate with door access control systems. For more information on selecting the right software take a look at our article How to Select the Right Video Recording System, or just contact us for help selecting your complete IP camera system. VMS is video management software. It is a key part of the IP camera system. VMS is software that runs on your Windows computer. It provides a similar function as the network video recorder (NVR) but provides more flexibility. The Video management software (VMS) is responsible for locating, and attaching to all the IP cameras on the network, providing a secure connection to the cameras, and recording all the specified video from all the cameras. VMS software also provides alerts to the security person. The more advanced VMS is able to integrate with IP door Access Control systems. The computer used to run the VMS software needs to have enough performance and storage to support the number of attached IP cameras. The more cameras and the higher the resolution of the cameras the higher the performance required. The length of time of the recorded video will determine the amount of hard drive storage required. An excellent solution when you require a web browser or mobile support. The server runs on a Windows computer. The client viewing software doesn’t just work on Windows Explorer, it also works on Firefox, Safari, and Chrome, so you can view cameras on your Apple Mac. It also supports smartphones including iPhone, Blackberry, Windows Mobile, and Android mobile phones without the installation of an App. It only supports one-way audio recording from the camera location. Supports many cameras per server with multiple video servers controlled by the viewing clients. Includes facility mapping functions that allow you to easily locate your cameras. This video management software is extremely easy to use yet it has some very powerful features. It not only supports the Hanwha cameras, it also supports IP cameras that conform to OnVIF, and today this means almost all other cameras. The client software runs on Windows, Mac, Linux and mobile smartphone clients making it a very flexible solution. The software is excellent when you require real-time notification and automated responses to alarms. Here are some of the key features. This powerful if-then function allows you to establish output actions based on detected inputs. It is most effective when it is teamed with the X-Series Hanwha cameras. Since these cameras include advanced analytics, you can automate a response when a gunshot is heard, or when someone takes an object. It provides an amazing set of real-time responses to situations. whether you have a remote computer or a mobile smartphone, you can view and control all your cameras. The software allows you to easily merge many servers so that all the cameras can be viewed from a single source. By utilizing the centralized cloud system, you can have a camera system in many remote locations and then merge them into one powerful system. This is very expandable and flexible video management software. It supports a very large number of camera manufacturers including cameras that conform to OnVIF standards. There are a number of different versions available. XProtect Essential to XProtect Professional. There are also advanced systems called Enterprise, Expert, and Corporate. The high-end versions of this software support hundreds of cameras that can be located in many different locations. The Corporate versions allow central administration of all your cameras. Axis is now part of Canon. Axis Camera Station is a small to mid-range single-server product. This is IP-Surveillance software that only works with Axis network cameras and video servers to provide video monitoring, recording and event management functions. Users can record video continuously, on schedule, on an alarm and/or on motion detection. The software has multiple search functions for recorded events. Remote viewing and playback are also possible with the use of a Web browser or the AXIS Camera Station Windows client. The software supports up to 25 cameras with up to 16 cameras per viewing window. Economical software for home and small business from Axis that only works with Axis cameras. Only supports one-way audio from the camera. Supports up to 16 cameras per server with multiple video servers controlled by the viewing clients. Please contact us for help selecting the right software for your application. The AXIS Camera Explorer Discontinued. NUUO: Is a simple video management software solution.